It seems the political Left is suddenly terrified by marijuana. Land of the shackled, home of the increasingly bound. If you want to see what unfolding tyranny looks like, look to Connecticut where not only gun rights are being taken, but police intervene and block even talk of legal redress. In Mexico, at the scene of a cartel shoot-out with Mexican authorities, says CNN. Exactly how close, you say?
. @gailtalk @TwitchyTeam Were they reloading for them too? So glad I don't live in Connecticut. Failure to comply is a felony. Still, I gotta wonder how many will defy the law and keep an unregistered stash on the side. Or have already moved (or at least relocated their arms) out of Connecticut in protest. It takes a truly foolish Republican consultant to declare war on the party’s most energized troops — the same foolish politico who once advised Republicans to work in favor of gun control and who ran the incompetent 1996 presidential campaign of Bob Dole. This exemplifies I say the Republican Party doesn't want to win, and seems quietly content with enabling the the leftist push by Democrats. The GOP establishment delivers defeat after defeat. Yet it snubs the victories and viewpoints of conservatives who oft cite the Constitution or dare defend the founders' America. H/T: Sipsey Street for linking to the NR article. This hasn't seen a lot of press, but it looks interesting. Eight Democrats are sponsoring legislation that would eliminate the death penalty for treason and other federal crimes. 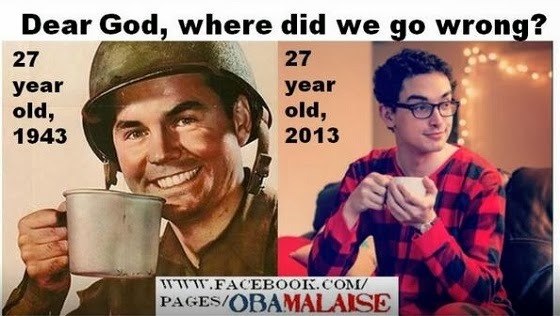 How's that "hope and change" workin' out? Drive-by shooting near the White House. The difference between true political leaders and today's large numbers of political hack posers can be obvious when the unexpected strikes. The Duck Dynasty brouhaha helped to showcase this. Leaders know what they believe, exercise personal judgment, and aren't afraid to express their own opinion. The hacks hold back, waiting for poll results or a focus group report before daring to speak. Is this what has Republican "leadership" scheming to move the party to the Left? The so-called Red States look less and less like Blue States. The closet progressive Republicans in DC are starting to sweat they'll be left with a country that no longer tolerates a super-sized federal government that demands one-size-fits-all compliance. So, the Republican Party in DC - rather than try to more closely align with the will of its voter base (perhaps former voter base) - is now dictating that constitutionally minded constituencies shut up, and slip to the Left (or, as they say, be more moderate) like the GOP leadership in DC. All for the sake of party unity, of course. Guess what. Ain't gonna happen. Meanwhile, the Dems are delighted their Blue States become increasingly socialist - even totalitarian. This, of course, aligns well with the bigger central government path DC elites in both parties envision for the whole nation. Report: Supreme Court Justice Sonia Sotomayor to drop New Year's ball on Times Square. Yeah. And Miley Cyrus will be there too. My expectations for 2014 were already gloomy. They just got gloomier. But are there bigger reasons why the Obama White House invoked executive privilege to keep the truth about Fast and Furious under wraps? John Dodson, the federal agent who blew the lid off the Justice Department’s “Fast and Furious” gun-walking scandal, claims the FBI had ties to the men who killed U.S. Border Patrol Agent Brian Terry in 2010 near Nogales, Ariz. In fact, Dodson says the Mexican bandits who gunned down Terry were working for FBI operatives and had been sent to the border to do a “drug rip-off” using intelligence gathered by the DEA. The Obama agenda benefits from a lawless border so it can justify moving forward on "reforms" - both in firearms restrictions and immigration. Nothing about Fast and Furious seems too far fetched. Except the administration's instance that there's nothing to see here. A&E takes back Phil Robertson. And A&E's reversal comes just a day or two after Jesse Jackson joined with GLAAD in going after Robertson. Perhaps A&E selfishly believes a Jesse Jackson led boycott will attract more views than it chases away. Or maybe it's more simple than that. Maybe A&E finally realized how stupid the whole hiatus drama was in the first place. Flint, Michigan looks bad. But how 'bout your own backyard? Flint, Michigan looks plenty bad, but what should scare us more is that Flint-like collapses are spreading. It's not just the auto industry that's shriveled or moved offshore. All types of industry have downsized, packed up or simply shutdown all over America. Look closely where you live, you'll likely see troubling signs there too. Maybe not to the extend of collapse, but economic contractions can be clearly noted. The shrinking economic base isn't just confined to the rust belt anymore. Some places are still lucky enough to pass things off as "doldrums," or still explain decline as a temporary downturn. Other communities, however, are now beginning to realize what's happening to them may be irreversible trends in a fundamentally transforming America. Demand high? Resupply levels low? Some of each? 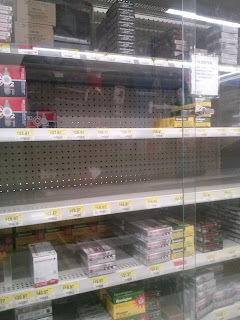 Walmart still can't seem to keep ammo in stock in some calibers. Most pistol ammo missing or in short supply here. Photo shot at a suburban Atlanta Walmart about a week before Christmas. When is the "knockout game" a federal crime? Apparently only when the victim is black, and the suspected perp is white. How many black-on-white knockout attacks have federal authorities ignored? Seems there's a double standard at Holder's DOJ. A financial adviser and Forbes contributor says he thinks an ongoing economic malaise is more likely than a financial collapse. But David John Marotta still suggests guns and ammo be on your preps list. On the surface, it looks like Obama's a champ at deporting illegal aliens. Or so the government and the New York Times want you think. But is it as they claim? ICE counts those caught while trying to cross the border, according to Texas Congressman Lamar Smith, who says deportation rates may be in decline going back to 2009 - when Obama policy was first coming online. Mr. Smith justified his findings by saying that it is “dishonest” to include those illegal immigrants seized by Border Patrol trying to cross the border as removals made by ICE. He went on to say that the Border Patrol program removals do not place any restrictions on illegal immigrants for returning to the United States. In other words, one single illegal immigrant can reach the border many times in one year and be counted as a removal each time. Having high deportation numbers apparently serves the administration's agenda. It feigns "toughness" - and helps galvanize support on the Left for immigration amnesty. 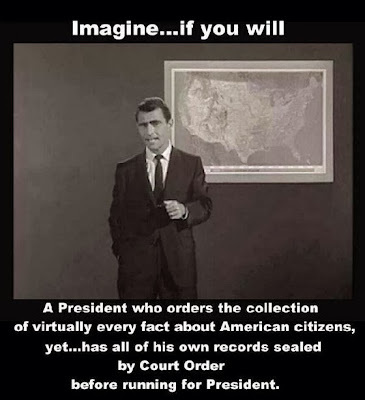 The president and his administration lies and manipulates on most everything. Understand this, and you have a better understanding of the harm they do, or want to do, to America. 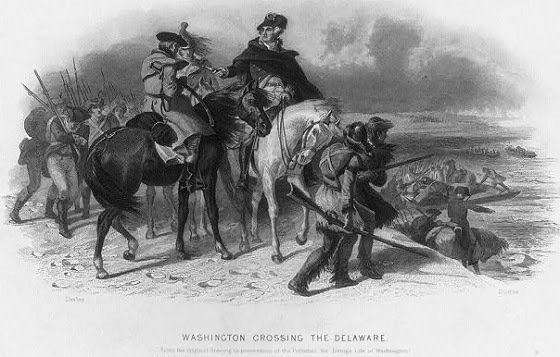 It was on Christmas night, December 25, 1776 that General Washington and American troops began crossing the Delaware River on their way to take the town of Trenton, New Jersey, which was in the hands of Hessian troops serving as mercenaries working for the British crown. The battle of Trenton took place on the morning of December 26, 1776. 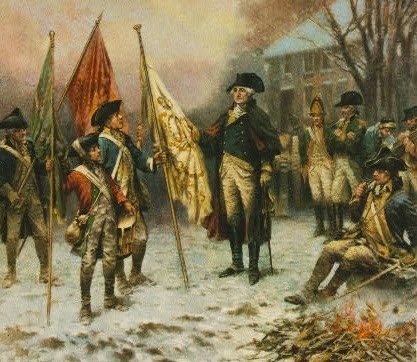 Washington inspects the Hessian colors after taking Trenton. Percy Morgan, artist. Published 1914. Bureaucrats. How'd Santa ever get along without 'em? 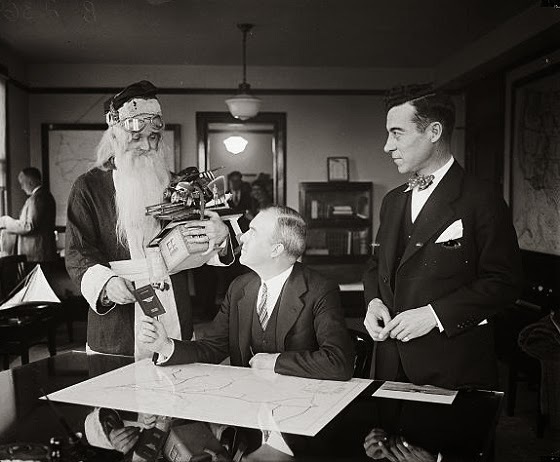 Santa Claus receives aeroplane pilot's license from Assistant Secretary of Commerce. Although there may not be sufficient snow for his reindeer sleigh, Santa Claus will still be able to deliver his load of presents on time this Christmas by using the air route. The old saint called at the Commerce Department in Washington today where he is shown receiving an aeroplane pilot's license from Assistant Secretary of Commerce. for Aeronautics William P. MacCracken, while Clarence M. Young (right) Director of Aeronautics, Department of Commerce, looks on. 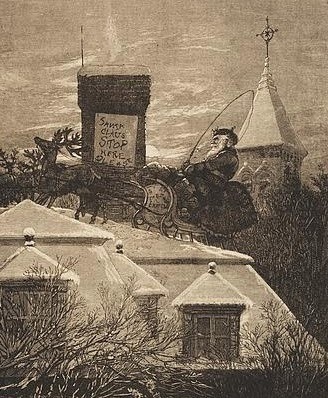 Airway maps and the assurance that the lights would be burning on the airways Christmas Eve were also given to Santa. I may post one or two more things that amuse me later today, but I'm mostly targeting a day of relaxation and reflection on this Christmas Eve. I may pick a book off the shelf rather than spend time surfing the web. We make too much of the hype, not enough of the personal reflection and true fellowship with family and friends that used to accompany our holidays. I wish this would change. 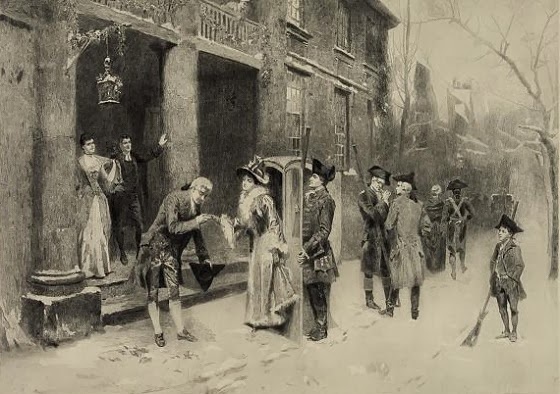 "Christmas Eve in Colonial Times"
I've done my best to avoid most retailers this Christmas shopping season that opened their doors on Thanksgiving Day. No, I've not been entirely successful. But the very few times I have gone, I've spent little or was accompanying someone who had a specific purpose for going. Entering a Walmart would normally be at least a weekly experience. I've been once since Thanksgiving. If retail sales are any indicator, there may be others who still resent Big Retail's intrusion on Thanksgiving. Retail sales numbers are said to be petty dismal this year. I still have a few presents to wrap. Some family members have visited, and already departed to return home out of state. Others will be coming tonight to spend a couple days. So please forgive my absence if there's a posting lull through Christmas. Most of us tend to need more quiet time, whether we know it or not. And that includes a break from the web once in a while. So again let me say, Merry Christmas. My wish is that we all do at least a little to put some quiet reverence back into what was once intended to be a holy observance as well was a national holiday. The Washington Post says Obama's signed up for Obamacare. But the same article says he's keeping his existing plan - where the military provides his medical care. 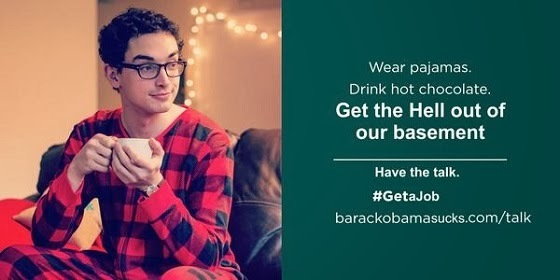 Obama's O-care sign-up is symbolic at best. It's kind of like if he enrolled his kids in DC public schools - but never sent them - and they continued to attend their elite private school. We have a president who mocks us. carrying about 6 million gifts for the children of Europe who were affected by World War I. The U.S.S. Jason of the era was a collier. During the World War I, Navy colliers were sometimes used to transport oversize or priority cargoes. More, more, more domestic spying! Obama purportedly formed a panel to look into intrusive abuses on American citizens' privacy by the NSA. The panel is now reporting back. One member openly advocates more spying on you and me, not less. Has anyone in the world ever indulged in the kind of surveillance fantasies these people do? Don't get me wrong, I respect and admire those serving in the military and the the families who also share the sacrifices when members are serving, or who have suffered the loss of a family member while in service to America. But a military themed Christmas that's been cooked up by the White House strikes me as a strange. Much as I love and respect those who serve, Christmas is not about gathering around the military or paying tribute to our armed forces. There was a time that the White House actually actually referenced Christ when celebrating Christmas, and acknowledged the traditional meaning of the holiday. Some celebrate Christmas as the birthday of a great and good philosopher and teacher. 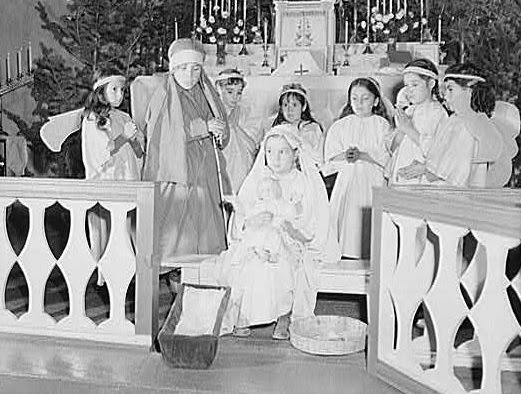 Others of us believe in the divinity of the child born in Bethlehem, that he was and is the promised Prince of Peace. Yes, we've questioned why he who could perform miracles chose to come among us as a helpless babe, but maybe that was his first miracle, his first great lesson that we should learn to care for one another. Tonight, in millions of American homes, the glow of the Christmas tree is a reflection of the love Jesus taught us. Like the shepherds and wise men of that first Christmas, we Americans have always tried to follow a higher light, a star, if you will. At lonely campfire vigils along the frontier, in the darkest days of the Great Depression, through war and peace, the twin beacons of faith and freedom have brightened the American sky. At times our footsteps may have faltered, but trusting in God's help, we've never lost our way. Just across the way from the White House stand the two great emblems of the holiday season: a Menorah, symbolizing the Jewish festival of Hanukkah, and the National Christmas Tree, a beautiful towering blue spruce from Pennsylvania. Like the National Christmas Tree, our country is a living, growing thing planted in rich American soil. Only our devoted care can bring it to full flower. So, let this holiday season be for us a time of rededication. Back to the Obamas for a sec. They seem to blur a lot of lines this Christmas. More than usual. It's as if they rolled Memorial Day, Gold Star Mothers Day, and Christmas all into one before jetting off to play on the beaches and golf courses of Hawaii. Strikes me as just another anecdotal example reflecting how little the Obamas understand or respect the traditional American experience, let alone the American Christmas holiday. Because we're so caught up in modern trappings, we miss seeing how closely our times resemble those of the past. 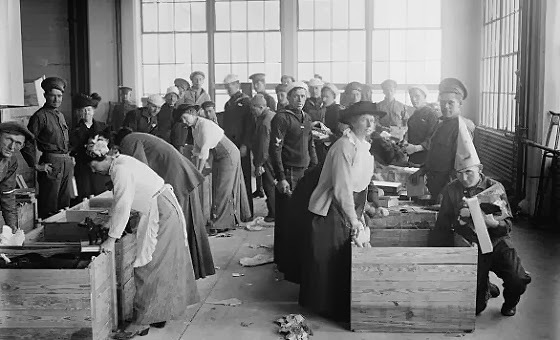 "Lessons of the Great War"
The essay is from Brookings, oft said to be a center-left think tank. I haven't read the article close enough to assess all the comparisons it makes; I'm just noting that the arrogance of any era can lead to circumstances where societies repeat mistakes of the past because lessons once learned were lost in the passing of time and generations. Republican voters, you've been sold out. I've been in several discussions this week with people who don't understand why conservatives are upset and outraged with Republican Party leadership. To them, conservatives are dividing the party - lessening chances of Republican victories next November. My counter point is that GOP leadership has sold-out and now embraces Obama's fundamental transformation of America. Were it not for conservative outrage and grassroots lobbying, the Obama agenda would be moving forward much, much faster. Alas, my friends don't see it. They seem to insist the GOP is fully engaged in fighting the Dems. Even the New York Times noted earlier this year that Speaker Boehner had become more an ally than a foe of O.
America's changed a lot over the years. So has the way its government portrays the American people. While John Boehner ups attacks on conservative groups (and thereby the Republican Party conservative base), here's a look at the sorry state affairs at the local GOP in Boehner's backyard. It appears Republican leadership has thrown all-in with Obama's remake of America. Don and I talk about the rock solid evidence beginning at 1 pm EST. Seriously, people. Things seem to be getting worse by the day. 2014 is going to be a critical year. So, I'll pass along what I think is a great verbal essay from Bill Whittle. The only thing that I think would have enhanced this presentation is if Whittle had included some Republican sellouts in the rogues gallery shown behind him. Social media (and some MSM) is afire over the suspension/dismissal of Duck Dynasty star Phil Robertson. I won't bother to rehash the whole matter. But I have seen posts saying that A&E continues to promote the show, and apparently still has Robertson related merchandise for sale. A&E trying to have it both ways? A&E is jointly owned by Disney and Hearst for those interested in making their reactions known in A&E's corporate world. No explaining the way Harry Reid runs the senate. Except he's willing to now do things he previously said would ruin America. Dems make the most of their energetic, dedicated, "radical" base. GOPers are ashamed to have one. The GOP is not an opposition party. It's mostly can-kickers and appeasers. With a few outright Quislings. We have to get past a mindset that the US is forever. If not cared for, it will fail. Perhaps quickly. Since I was a kid, I've always enjoyed the Twilight Zone. And now I"m glad to see I'm apparently not the only one who's having bouts where I feel like I'm living in it. But now the holidays are focused on the White House and two dogs. At least that's the way the official White House "holiday" card makes it look. History revisionists are at it again. There's talk that portraits of Robert E. Lee and Stonewall Jackson may be out at the U.S. War College. Sorry, doesn't seem right. The War College isn't supposed to be exclusively about U.S. figures and tactics anyway. Besides Lee and Jackson were certainly central figures in a more broadly defined U.S. military experience. If this purge of Lee and Jackson takes place, what's next? Bulldozing Lee's house at Arlington? Or maybe the PC crowd will call for something like the Taliban did to an ancient Buddha in Afghanistan, and blast the Confederate memorial off the side of Georgia's Stone Mountain. It's been said, "Those who cannot remember the past, are condemned to repeat it." Perhaps those who attempt to purge history are setting us up, intentionally or not, for disastrous consequences down the road. Update: Was the story overblown? Or is the War College now playing a game of Duck and Cover? An African-American student at Sacramento State University is under fire for her recent work of art – which consisted of “lynching” two white men from a tree on the northern California campus. The men were reportedly actors and were in no real danger during the project, which took place during the day in early December while students were on campus. The men were hung from a tree with a thick rope. The "artist" claims her work was designed to address an old but standing matter, according to a local TV station. Gimme a break. The intent here is to stir an old pot, reopen and exacerbate racial divisions and tensions dealt with long ago. Just pretend that they weren't. Of course, the "artist" had to reverse race roles. Had she "hung" black folk, Sharpton and Jackson and network satellite trucks would have likely been on campus with hours. Schumer thinks the 'sacrifice' of serving in the House or Senate goes deeper than vets who have faced hostile fire? This is not the America I grew up in. And this is not a Congress that would have pleased the founders. A former NSA official says we're already there. Government's already collecting data on nearly every facet of our lives. Just because it hasn't yet directly used your data against you doesn't mean it's not in the cards somewhere down the road. Oh, Angie Merkel chimes in with a related note. America's young adults have noticed Obamacare's a failure. They probably also understand that the government mocks them in its strange campaigns to enlist their support. Something this insulting begs for satirical rebuttal. 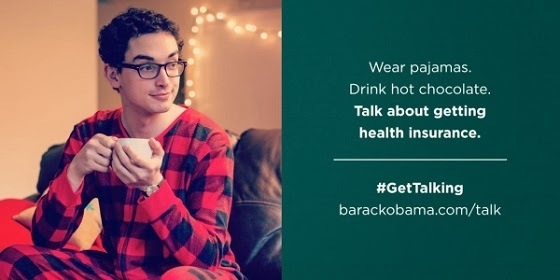 Many young adults have to be confused by the Obamacare push. Obamacare was sold to young adults saying they could remain on a parent's health insurance plan until age 26. Now, the government seems in a panic that young people under 26 aren't rushing in to buy their own plans (often at higher costs than would have been available pre-Obamacare). None of them will, moron. All they do is enable and guarantee more. Which means "progressives" will insist on expanding restrictions. And yes, it really did happen. Are legacy arms on your Christmas gift list? Not all guns that change hands at Christmas time are new ones, or even used ones bought from a dealer or private party. For those who want to give a firearm (or receive one) this Christmas, the holidays can be a great time to pass along an heirloom or legacy gun that's been in a family for years to the next generation. I've blogged about this in the past (here, here, and here, for example); it's not only a way to pass along a gun to an aspiring shooter, but some family history can be passed along as well. 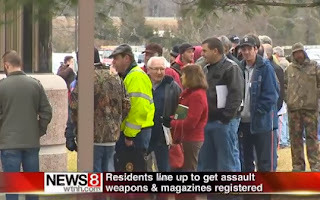 Another thing about legacy arms that some folks find appealing is that many were purchased and have been held in the same hands or family since before the government began requiring point-of-sale paperwork from gun buyers. I've also seen some great old .22 rifles from the 1930s and earlier that were produced without serial numbers. 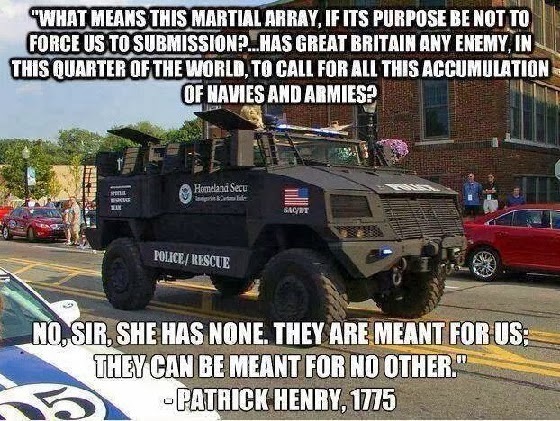 If nothing else, these oddities in our current age may open some eyes about how much more invasive government is today when it comes to regulating, and attempting to further regulate, the arms we keep. When I was a kid, NASA even put people on the moon. NASA's looking less and less like a space agency, and more like a propaganda wing of the radical progressive EPA. Update: Seems the Green Ninja thinks he's been treated unfairly. Awww. Ammo may be back on store shelves, and once again available through online retailers. AMMUNITION UPDATE. The CMP has been notified by ammunition manufacturers and distributors to expect price increases and significant delivery delays for all calibers of ammunition, especially for .22 rimfire. The price increases and delays apply to orders we have already placed with the manufacturers. Prior to 2013 CMP received deliveries of truckloads of ammo within a few weeks of placing orders. We are now being advised, as in the case of Aguila .22, that it may take several years to receive all of the 35,000,000 rounds of Aguila ammo we have on order. As a result of this situation, CMP has placed orders with several different manufacturers for large amounts of ammunition in various calibers. We expect to receive only a few pallets at a time because manufacturers and distributors are rationing the ammo to their customers. As we receive ammo, we will contact customers with oldest orders already in place with the option to purchase whatever we receive at the new prices, cancel the order, or remain on the list for the manufacturer they originally requested. All price increases to CMP will be passed on to the customer. CMP will not be profiting from the increase in prices. We will continue to accept orders for ammunition, with the understanding that the wait time for customers between placing an order and receiving the ammunition may be anywhere from a few weeks to a few years. Most other retailers are in the same situation as the CMP. We suggest that customers leave their CMP orders in place and not cancel until they are able to purchase ammo elsewhere. CMP customers will be contacted as to pricing and manufacturer before any orders are filled. We do not expect to have any additional information until after the annual SHOT Show in mid-January, when we will meet with all of the ammo manufacturers. I'd like to think we're continuing on a path where ammo supplies and retail inventories are on track toward pre-panic levels and more supply resiliency. But for those who want to keep shootin' through thick and thin, stocking ahead is a proven practice. Be prepared to ride out future shortages - be they short term or long term. But is Christmas the right time for the Fed to go Grinch? Congress proposes cuts in the future while eliminating cuts in the present that it promised to make in the past! 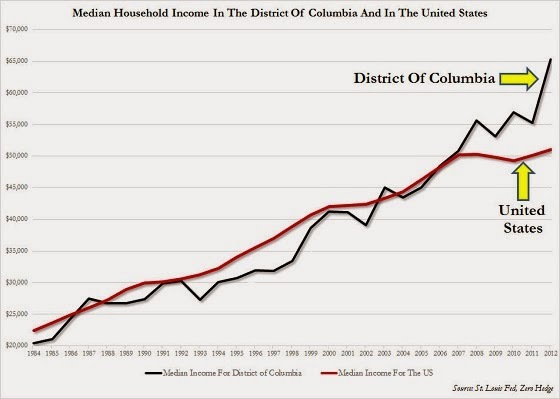 Washington's fiscal malfeasance won't end well. And when it does, the disaster will likely be beyond the scope and scale most Americans can even imagine. Eighty seconds. Because there was a deputy with a gun on the Arapahoe High campus, that's all it took 80 seconds to bring an end to Friday's shooting event. Anyone else remember how the Left scoffed when the NRA proposed armed security in more schools after Sandy Hook? While the Left derided the NRA, Barack Obama turned around and promised the same thing - only Obama called them "school resource officers." No, I'm not going to make one. But it does look kind of rustic holiday cool. But be careful. Something like this on your front door might trigger an overzealous SWAT raid in some American gun-grabber zones. It seems voices of concern are being raised over a candidate aspiring to rise to the NRA's board of directors in 2015. A letter from a reader at Sipsey Street cites a number of warning signs. NRA members may want to take a look. 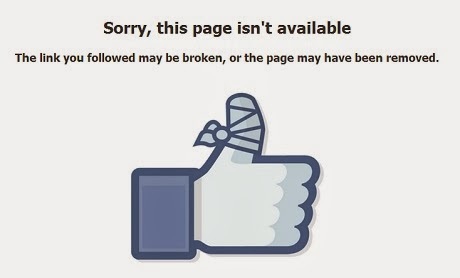 Social media is afire with criticism of the way the Denver Post deleted a reference to "Socialism" in its coverage profiling the now dead gunman in Friday's Colorado school shooting. Thomas Conrad, who had an economics class with the gunman, described him as a very opinionated Socialist. "He was exuberant I guess," Conrad told The Denver Post. Did the Post pull the quote because its accuracy was in question - or because of PC demands? Thomas Conrad, who had an economics class with Pierson, described him as very opinionated. "He was exuberant, I guess," Conrad said. "A lot of people picked on him, but it didn't seem to bother him." To eliminate the context provided by Socialism from the quote, specifically what Pierson was allegedly "exuberant" about, seems terribly misleading. If the Post had reason to doubt the quote's accuracy, it should have killed Conrad's entire quote, not doctored it to shield socialism. The Post story also said Pierson had "strong opinions about gun laws." But the Post never discloses what those opinions were. Again, strikes me as journalistic malpractice. Since we're talking about a gunman, the Post leaves open the interpretation that Pierson was gun rights fanatic. But in light of the Socialist comment, and other references, it seems logical to interpret Pierson was a gun control, or even a gun ban, supporter. The Post could have easily clarified - or should have never reported the "strong opinions about gun laws" line. Aside from sloppy reporting, I'm still struck by the timing of the attack: The final school day prior to the Newtown anniversary. I'm curious if Pierson was registered with Barack Obama's Organizing for Action, which had sought to sensationalize and elicit emotional observances of the Sandy Hook killings. Pierson reportedly had it in for his librarian/debate coach since September, but waited until the Sandy Hook anniversary to launch his vengeance assault. Could be coincidence. Could be. But it's also possible he wanted to make the biggest splash possible for gun control, if that's where his political sympathies were, while carrying out his plan to "get even." Given that news reporting to date has seemingly been sanitized to comply with Colorado's politically correct anti-gun crusaders, I'm not sure we'll get the straight story here. Then again, Pierson may taken with him the ability to more fully understand his motivations when he pulled the trigger and committed suicide. Mike Bloomberg and his billions are staying in the gun control fight. Get ready to see what they try to push in 2014. Last weekend, I came across a self defense guide for women published in the mid-70s. Looking Forward To Being Attacked was written by Jim Bullard, who at the time was a lieutenant with the Memphis Police Department. 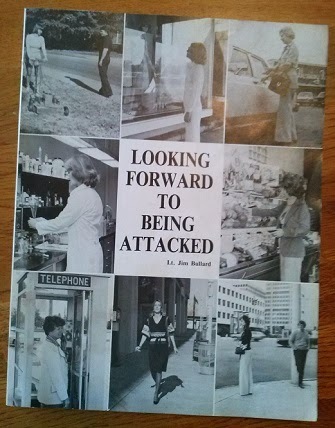 The delightful subject of this book is your being attacked; attacked on the street, in a parking lot, in an elevator, in your car, in your bedroom, in the library's social science section, in your dentist's office, etc. Wherever you are in today's social climate, your are subject to attack which is terrific because when you finish with this book, you are going to be looking forward to being attacked! There is very little you can do about being subject to attack, but there is a big difference between being the subject of an attack and being victim of that attack. The attitude you must adopt is that you will not let anyone spoil even three minutes of your day. This attitutude is an important element in your defense... Take offense every time offended - react in anger, not in fear. Channel anger in a positive direction and if will work for your self defense. Fear is crippling, but anger will give you strength of courage to do what you must do. Things sure were different in the era before political correctness. It was okay to be angry. And if attacked, the prevailing strategy was to prevail against your attacker with force. If he shows interest in you, let him get close enough but then kill him... Close his throat or take his eyes out. Remember, don't attack him. Let him escape if he will. However, if it's hurting you he has in mind: kill him. Don't let anyone spoil three minutes of your day; no one has that right. Today we're told we're supposed to get weepy, show regret, even apologize if we're put in a position where we're forced to defend ourselves. By Bullard's logic, today's philosophies and prevailing attitudes would seemingly tend to put a defender at a huge disadvantage from the start. Bullard's advice on self defense relied primarily on smarts, anger, and quick martial arts like moves by the defender's body. Today's progressives often insist, or at least imply, women aren't smart enough or strong enough to physically defend themselves against an attacker. Is what they preach today really progress? A Chinese naval vessel tried to force a U.S. guided missile warship to stop in international waters recently, causing a tense military standoff in the latest case of Chinese maritime harassment, according to defense officials. What if there's more to this than a blind power grab by China? What's the motive behind China's sudden beligerence over these waters? Strikes me, the Chinese economy may be in more trouble than most understand. In advance of economic turmoil at home, the Chinese government may hope manufacture stronger external enemies to deflect attention away from growing troubles at home. Finally, there’s the idea that citizens need guns so they can, if need be, oppose the force of a repressive government. Those who think there are current (or likely future) government actions in this country that would require armed resistance are living a paranoid fantasy. The idea that armed American citizens could stand up to our military is beyond fantasy. There’s this idea among authoritarians that the arms of the citizens, if need be, can be suppressed easily by repressive government. Those who think there are current (or likely future) government actions in this country that would could long survive an armed resistance are living a statist fantasy. The idea that armed American citizens couldn’t stand up to a relative handful of authoritarians is beyond fantasy. Strikes me, the whole idea of one side or the other declaring a shooting civil war is the real fantasy. Not to say we won't some day stumble into one if unrest leads to armed conflict following a collapsed dollar or some other unmanageable economic calamity. Think about it. Can a government that can't build a functioning health care insurance website in three and half years really be counted on to maintain an economy that keeps food on the shelves, lights in our homes, or maintain a viable currency? Now it appears the NFL is working to make the term Super Bowl synonymous with the term Police State. Big Sports and Big Government have joined forces to promote Big Totalitarianism. No, this is not a good thing. Fiscal conservatives are apparently not surrendering their principles or abandoning common sense fast enough to suit House Speaker John Boehner. Boehner's reaction to conservative push-back is just more proof the whole compromise deal is one designed to protect status quo and incumbents of both parties in next year's mid-term elections. A first step to overt steps toward government control of the stories you see and hear in the so-called mainstream media? Gun control is back in play in the Congress. So now we have the worst of both worlds: Congress has given the plastic gun ban a ten-year carte blanche, which will allow the Obama administration to engage in all of the anti-gun mischief that its sloppy language invites. And, at the same time, both Democrats and Republicans (like Grassley) are now committed to making the gun ban even broader over the next two months. Last December, Democrats made a brash grab at gun control and, for a short time, some of them even suggested confiscation might be in the works. Defenders of the Second Amendment pushed back, and the Left's dreams of what they labeled an assault weapon ban was pushed back into its bottle. I don't expect a full frontal assault in the next go-round. Look for more innocent sounding piecemeal legislation. But I also expect there will be deceptive language in any new or rewrite bill to lay framework for much wider gun control in whatever is attempted. Be forewarned. This is no time to let our guard down. How can you have an economic recovery when you have a federal government and busy-body regulators than keep getting in the way? Dodd-Frank rules and regulations kicking in at a new level in the early part of 2014, we don't see an outpouring of enthusiasm among traditional regional bank lenders in the land acquisition and development lending space. 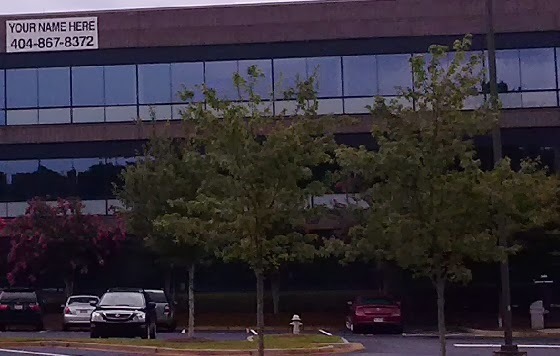 Banks are girding for new qualified mortgage and qualified residential mortgage rules and regulation, servicers are still convulsing from the non-stop binge of federal and local liability issues that stalk them since the housing crisis days, and consumers themselves continue to be plagued with uncertainties in job security and wage growth. I've seen ads recently touting home buyer and refinance mortgage rates at around 2 1/2 percent. 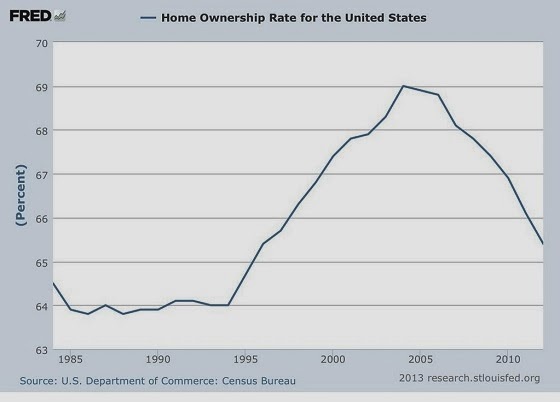 But I've also seen stories and a chart showing home ownership rates in American continue to fall. Democrats and most Republicans in DC seem to be falling all over themselves in praise of the "bi-partisan" federal budget deal announced Tuesday. This is nothing but a sham. A Washington Times headline notes: "New budget accord saves $23 billion — after $65 billion spending spree." This is no kind of fix. This is no improvement. The touted "compromise" is political gamesmanship designed to spend more money we don't have, intended to sweep serious fiscal issues under the rug until after the November 2014 midterm elections. The proposed "deal" is nothing but a bi-partisan ploy to mask the ugly realities of an increasingly unsustainable America. Politicians are doing their best to continue an illusion of normal in an America that's everything but. I might nitpick some its parsings, but even Mother Jones understands the trend is not our friend. Alan Grayson, the Tea Party bashing Democrat Congressman from Florida has something new to put on his resume. News account says he got taken for $18 million. Spread the wealth around, as certain Dems are fond of saying. First Precinct Capt. Steve Dolunt added that guns are being stolen from Lions fans who leave them in their vehicles because of the NFL’s firearms prohibition. Because of a new rule barring off-duty police officers from carrying weapons into football stadiums, Dolunt said a Detroit police officer’s gun was stolen from his car earlier this season. Or, under Obamacare, maybe not. December 9, 2007: An armed church staffer shot and killed a gunman who was heavily armed and intent on killing Christians. 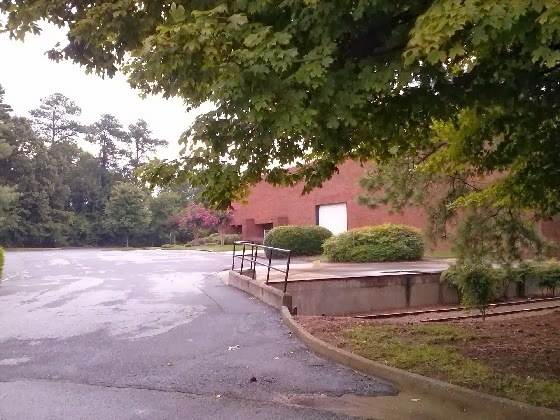 The show was at the South Atlanta Expo Center. This is a huge facility but due to a lack of sufficient vendors, it was not as fully used as I have seen in the past. There was room for at least a 25% increase in vendor occupied space but still it was a very large show. The show sponsor used the extra available space to considerably expand the width of the aisles which, given the heavy attendance, made for a much more pleasant experience for the shoppers. It was noon before the line to get in shortened much from its initial 100 yard length. Private sales (except for guns) seemed to have returned to pre-panic levels and this was where most of the best deals were to be found. For example, I picked up 1,000 .45 ACP once-fired cases in their original boxes and case packaging for $35 and 8 pounds of an uncommon but excellent shotgun and pistol powder for $80. A friend who is one of the biggest ammunition component (brass, bullets, primers, and powder) dealers in the country was present and had almost as much stock on hand as in pre-panic times. Nevertheless he had no surplus powders and his assortment of bullets was much less in the popular .308 caliber. All components were priced 10-20% higher than last year. Though he had three competitors at the show, his prices were by far the best available from a dealer. So why did some people pay more for exactly the same components? The low priced dealer was strictly a mom and pop operation and it was often very time consuming to wait for a chance to get the best deal price wise. I noticed that people buying $500 to several thousand worth of components waited to get to the low priced dealer while those wanting small amounts opted for speed over best price. Capitalism in action! The only loaded ammunition still in shortage status is .22LR but the average price for 500 rounds has dropped to $40-55 depending on the specific brand and type. Private sellers still seemed to be dominating this niche of the ammo market. As far as is known, the government is not in this part of the market in any significant way so the persistence of the .22LR shortage is a signal indicator that the ammo buying habits of a big swath of the American public has changed toward getting and holding significant quantities of this primary caliber. The general availability of most types of guns continues to recover and prices for those most readily available continue to drop. Some of the prices I saw were: generic AR15 type rifles $599, used 12 ga. shotguns $250-300, Mosin-Nagan $99, nice used Model 94 Winchester in .30-30 $295, typical used M1 rifle $800-1,000, beat up but sound Colt .38 Special $300, Witness 10mm pistol $400, and Beretta CX4 Carbine in 9mm $ 750-950. Shortages remain in .308 ARs and heavy barreled bolt action rifles designed for long-range accuracy. There seemed to me to be at least 50% more dealers with various assortments of prepper type supplies and they mostly had a lot more lookers and buyers than usual. The medical supply, steel ammo can, water purification, security paraphernalia, long term storage food, and general military surplus dealers were doing the best business I have ever observed at a gun show. I got the distinct impression that many buyers have filled what they believe to be their general gun and ammo needs and are now moving on to more esoteric supplies. But, that does not mean that the gun and ammo dealers were suffering; they too were doing a brisk business. I think significant numbers of people are going to have a Merry gun show product Christmas one way or the other. My estimate is that if there are no more political or terrorism shocks, gun and ammo availability will continue to increase as prices continue to drift lower. On the other hand, if we are at a upward inflection point in prepper type awareness, the current excellent availability and pricing of prepper supplies could reverse very sharply. The supply lines of such supplies and equipment are minuscule compared to the levels of guns and ammo before they virtually disappeared in the late Nov-Dec 2012 time period. The worshipful tone of American TV news coverage of Nelson Mandela has been way, way over the top. I am pleased to see the New York Times (yes, the Times) takes a stab at some balance. Few disagree that Mandela's tuning in to compromise opened the door to great things. America, on the other hand, has a petulant, pouty president who refuses to compromise. Mandela was a man who was able to see beyond race. American progressives and our president hide behind race, using it as a shield, as a weapon to attack opponents often where race is not a factor at all. Barack Obama and his progressive allies could learn a thing or two from the Mandela we see in today's Times piece. Obama's Pentagon bean counters propose closing state-side military commissaries. If the Pentagon is serious about saving some money, how about getting the Air Force out of the political air taxi business? An unarmed man gets in an altercation with cops. Cops draw guns, shoot at man but miss, hitting bystanders. So, what do prosecutors do? Charge the cops' intended target with the injuries that resulted from the cops' gunfire. Yes, it happened. Welcome to the new, progressive New York City. Sorting through a mason jar of pennies that's collected on my bookcase over the past year or two. So far, the tally is 600 that are the "new" formulation Lincole cents minted from 1983 and going forward to the present. Fifty with the Lincoln Memorial on the back minted in 1982 or earlier (higher copper content). And two Lincoln "wheat cents" (one from 1944, the other from 1941). Time's been short. Blogging's been scant. 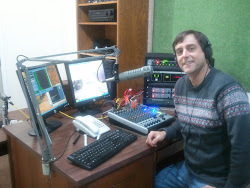 But Don and I will do our show today (Friday, December 6th). We'll get ya caught up on things. I guess if you get enough folks drunk enough, a few of 'em might still think Obamacare's a good idea. Don't laugh. The president suggests sympathetic bartenders host happy hours to promote ACA enrollment. Sounds like the old Soviet model: Keep the masses plied with vodka, and they might not notice or bother to complain how crappy everything else is. The more trouble Democrats get into, the more the Republicans show their progressive priorities, and rush to their rescue. Just watch the movements of Republican House Speaker John Boehner. In October, Boehner surrendered all over the government shutdown, leaving his party to bear the blame of shutdown triggered by the Dems. And now? Boehner's marshaling resources to push immigration reform. Rebecca Tallent, director of immigration policy at the Bipartisan Policy Center, will start her new job as assistant to the Speaker on Wednesday. Her arrival was one of several personnel moves Boehner announced Tuesday. Tallent previously served as chief of staff to Sen. John McCain (R-Ariz.) and was deeply involved in efforts to pass immigration reform in 2006 and 2007. Advocates for immigration reform cheered the hiring of Tallent, viewing it as a sign that Boehner is serious about pursuing legislation in 2014. Republican progressives count on sheeple voters not understanding that Republican is not synonymous with conservative. Republican elites love their lo-info voters as much as the Dems love theirs. Congressman under attack because he won't collaborate with the collective. Better than they do the rest of us in the country they're supposed to be representing and looking out for. And yes, here's an OFA organizing letter that popped up on Twitter. Here's the actual OFA link, but you have to be a fast reader unless you have an OFA log-in. Barack Obama's White House says the president had never met his illegal alien Uncle Omar. But Uncle Omar said in court today that young Barry spent three weeks with him back in 1980. I don't know much about Uncle Omar's character. But I know Barack Obama and his White House have repeatedly lied to hundreds of millions of Americans on a number of other issues. What happens when a president puts himself above the law? A witness told congressional committee that it's possible the people might decide it's time for a change. Okay, so I'm a day late. December 2d shall henceforth be known as National Economic Disaster Day. On December 2, 1939, Senate Majority Leader Harry Reid was born in Searchlight, Nevada. On this date in 1970, the federal Environmental Protection Agency began operating. Five years ago today, then-newly elected President Barack Obama said he would act swiftly on an economic plan “to solve this crisis and to ease the burden on our states.” Americans still wait for action on that item. Also on this date in 2008, Senator Saxby Chambliss was re-elected in a runoff victory over Democrat Jim Martin. Nice to see Saxby gets lumped where he deserves... right in there with Reid and Obama. Not that I think Jim Martin would have been an improvement. But at least Martin told us who he really was, and what kind of senator he'd be if elected. With Chambliss, we just got snookered. Doing what I call "salvage ops" this week, helping sort through some of the junk in a long neglected basement prior to renovation of the house (not mine) getting underway. Under a deadline. A dumpster arrives Friday. Among the finds, about eight dozen Mason jars. 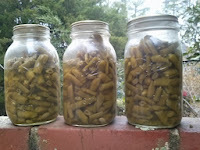 Three jars were still filled with home-canned green beans that looked as if they were fresh canned. Best I can tell from family history and the vintage of surrounding stuff, these beans have been stored at least a decade. Maybe a lot longer. Makes me rethink how long home-canned products might last under favorable conditions. I opened the bean jars prior to discarding their contents. Normal green bean smells. But no, I didn't sample for taste. No desire to play guinea pig or tempt fate when I'm already jammed for time. The association's sin, according to the feds, rested in its code of ethics. The code lays out ideals for members to follow—a commitment to students, colleagues, society. Tucked into this worthy document was a provision calling on teachers to respect their colleagues' studios, and not actively recruit students from other teachers. That's a common enough provision among professional organizations (doctors, lawyers), yet the FTC avers that the suggestion that Miss Sally not poach students from Miss Lucy was an attempt to raise prices for piano lessons. Given that the average lesson runs around $30 an hour, and that some devoted teachers still give lessons for $5 a pop, this is patently absurd. Abuse of power, clear and simple. And the government, under Obama, seems to enjoy testing its levels of pettiness. Or maybe pettiness isn't the issue. Perhaps we're being deliberately taken down a path to reveal how much tyranny we'll stand for, and by doing so incrementally, we're expected to become accustomed to more and more of it. It's a tried and true formula that's been used before. Who's going to be Team Obama's next target?